We see things everyday, from the moment we get up in the morning until we go to sleep at night. We look at everything around us using light. Light is all that our eyes can see. With the technological advancement, man is developing means by which he can improve this quality and use it for various purposes. Technology, hence, came out with an eye-catching product called Neon Open Signs. You can have a Neon Open Sign for your storefront. Neon open signs are a sure way to attract customers. You may also invest in a business neon sign that tells customers what you do! Neon signs for your business are the best way to advertise your business in a cost effective manner. In contrast to strong and monotonous forms of light such as fluorescent lamp light, the light emitted by neon signs has a pleasant effect upon people: as well as being able to represent several dozens of colors, it has the power to appeal to the subconscious mind. Neon Open Signs are effective! A Neon Open sign can be eye catching, attractive, and enhance any business or any room of your home. 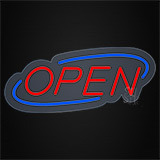 You can attract customers to your business by letting them know you are open with a Neon Open Sign. 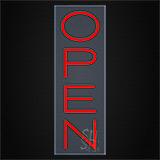 There is a wide selection of neon open signs. You are sure to find your customers with one these signs. Such Neon open signs are being used in a variety of businesses. Neon open signs pull potential customers in with cost effective and powerful advertising. Importantly, the neon open sign’s intense light and color sells product right outside of your retail door - exactly where the passerby can enter your store and buy. What better place to implant a visible, intense and permanent message for your company. You can't get that with television, magazines or most other forms of advertising. There are many places where such Neon Open signs can be used. Also their applications make them more useful for use and they can be put up anywhere and everywhere. Let us see some examples. If you are looking for something non-traditional, get the new look with the Neon Open Sign. With slanted lettering and slanted colorful shapes in the background, it's different, fun, and sure to increase traffic to your store. You can even get vertical with the Open Vertical neon sign! This Neon Open Sign can be placed in anywhere in the crowded windows with limited horizontal space, making the best use of the space available. It is especially great for liquor stores, specialty shops, and smaller storefronts. Backlit Neon open signs are always economical, colorful, attractive and eye-catching. They carry distinctive and suitable lights suitable for hair salons, cellular phone stores and more. These neon open signs do work. 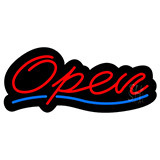 The best thing about these Neon open Signs is that they can make your customers know that you are open and ready to serve them with a neon open sign. A brilliant neon open sign will present a professional image and let customers know they are welcome. There are a large variety of Open Neon Signs available in the market. In today's cluttered marketplace, getting your brand noticed can be a tough job. You need a tough partner. Such Neon open sign products make you stand out from the crowd and get noticed! Over time, this can have a significant impact upon the sales of your product and the success of your company. Neon Open Signs are also ideal for store windows. You can attract lots of customers’ attention using the latest open sign technology in a lightweight and energy efficient format. With a variety of sizes and functions you can pick the open sign the works best for your business. You can show your customers your beauty services at an economical price. Hence, Neon Open Signs are a must for any business. It gives a boost to the shopkeepers and retailers to increase the sales and also help promote their products in the most efficient and effective manner. In this competitive era, such Neon Open Signs, thus, play a major role in the market.